It was another picture-perfect day in Mazatlan, where it’s hard to imagine the weather isn’t always beautiful. 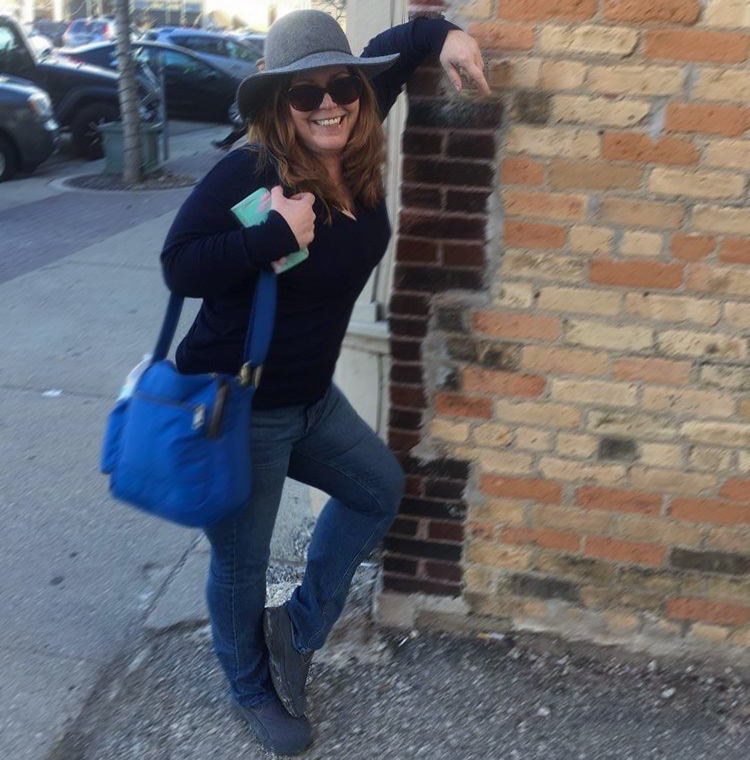 I picked the perfect time to come – though there are rarely bad times – with temperatures ranging in the high 70s and the sun constantly shining. There wasn’t any sunbathing for me, as I went touring some of the area’s newest hotels. 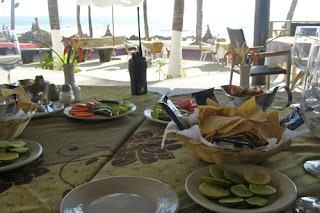 The day started with breakfast at La Terraza, a cute little restaurant at the Azteca Inn. I enjoyed the chips, salsa and cheese, before having my first taste of Corn Tamales. They were delicious (especially with the homemade salsa). After some coffee to energize, Maria Elena of the Mazatlan Hotel Association led me out to the van where Julio of Pronatours was once again at our service for the day. 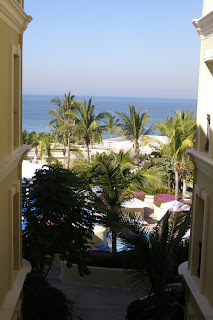 Our first stop was at Pueblo Bonito Emerald Bay and it was indeed bonita (beautiful). 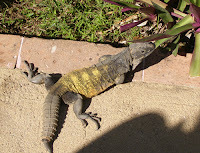 Each suite Jessica took us to appeared to be nicer than the last and the tropical atmosphere – complete with birds and iguanas – was more Caribbean than Mexican, making it stand out in Mazatlan. An all-inclusive option is coming to this all-suite resort in January and it is open to couples and families, with an adults-only pool offering a bit more quiet for those not with children. What struck me most about Pueblo Bonita was the vibrant colors throughout the resorts, especially showcased in the artwork. The spa is also incredible, with the aromas beckoning you to the Jacuzzi, Hot and Cold Plunge Pools, Steam Room, Swiss Shower, Biothermal Rain Shower, Walking Reflexology Path, Ice Station and Mist Shower before or after your treatment. 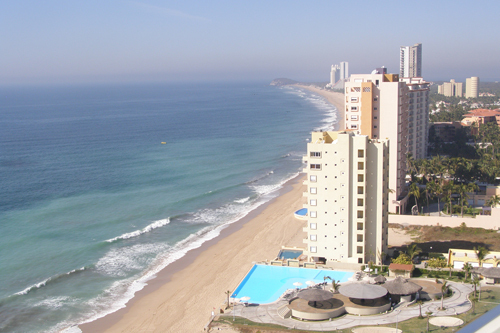 From Pueblo Bonita we were off to the Crowne Plaza Mazatlan. Unlike most classic Crowne Plaza hotels, this one is ultra-modern, welcoming you in the lobby with views of the infinity pool that seems to blend right into the Pacific Ocean. This resort has an all-inclusive option as well, and choices from Junior Suites to one, two and even three bedrooms with kitchens. The views are breathtaking (photo at the top of this post), with ocean views from all rooms. The Jacuzzi rooms extremely romantic. The Crowne Plaza has a small gym, but the ability to watch the blue waters as you walk the treadmill is a brilliant idea to get anyone working out! The spa is intimate and complete (chocolate wrap, anyone? 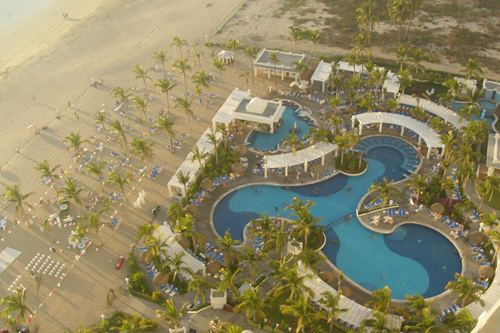 ), with the option to also get treatments in your room o on the beach. 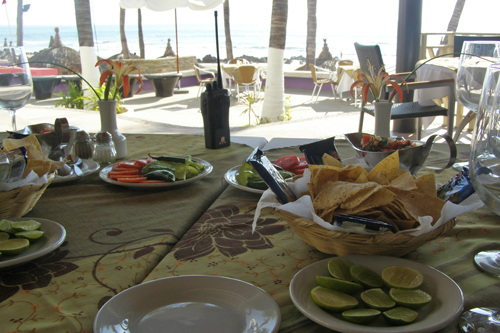 There are two al a carte restaurants on the premises and service is available at the pool. 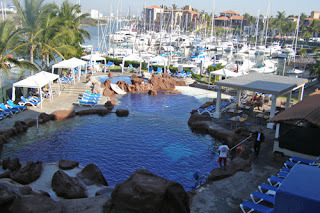 Our final hotel tour of the day was the El Cid Marina, one of three of the El Cid Resorts. This is the top of the line, with packages that include unlimited green fees for golfers. There are also options for various all-inclusive plans, allowing you to plan for all the needs of your vacation in advance. The kids’ playground is adorable, complete with a miniature merry-go-round, and parents can bring their kids to the camp and the other resort (free transportation is provided between El Cid properties). 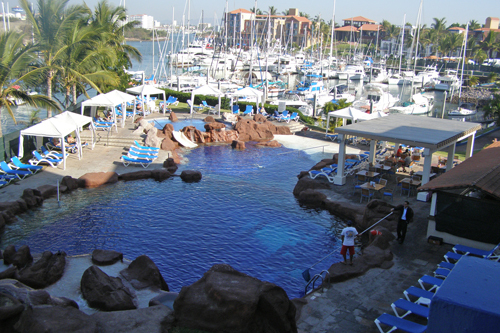 The El Cid Marina is made up of all suites – up to three bedroom – with views of the new area of Mazatlan, as well as the bay and the Marina. The grotto pool allows you to swim through the waterfalls and guests have the option of the beach by the pool, or taking a boat from the adjacent marina to a more private one. 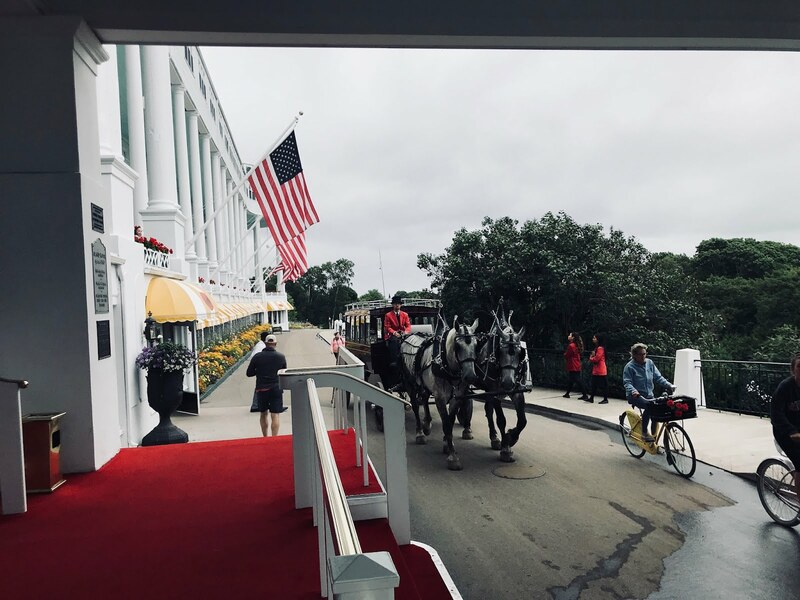 Guests staying at the El Cid Marina can eat anywhere within the properties, giving them a choice of 12 restaurants, and use the facilities of all those hotels. Lunch was at the Oceano Palace, where I had a delicious enchilada platter and a lively conversation with the wonderful Fermin Trucios, the hotel’s general manager and to my delight, a huge tennis fan. We traded tales of travel and tennis before I headed to one more hotel, the Riu Emerald Bay, where I am staying for the next three nights. I once again lucked out with a perfect suite, this one offering indoor and outdoor Jacuzzis, with the latter on the deck offering views of the beach, pool and the ideal sunset. I got to explore this bustling resort a bit in the evening, with three bars (including a 24 hour sports bar) going strong, and a selection of drinks and Martinis to keep everyone satisfied. I didn’t spend much time there, because it was late by the time I got back from Señor Frogs. My only previous experience at Señor Frogs was in Cancun and though it wasn’t Spring Break, it certainly had that atmosphere. This location was a bit calmer, though not at all lacking in fun. Tulio kept us laughing as the staff presented us with Sombreros, Balloon hats and marshmallows for throwing (yes, we had marshmallow fights!) in between, Maria Elena, Julio and I enjoyed (a few) of their Frozen Mango drinks, with vodka, rum, mango and Kahlua, a Tequila Cheese appetizer, Fajitas and a Messy Sundae. Just when I thought I couldn’t have another thing, Tulio was back with “Aqua del Rio.” Though I couldn’t get a confirmation of the secret ingredients, my best guess was Kahlua and tequila. Friday is a fun-filled day of touring the aquarium and its new Shark Exhibit, followed by the afternoon at the Riu Emerald Bay Spa and the evening at the ballet.